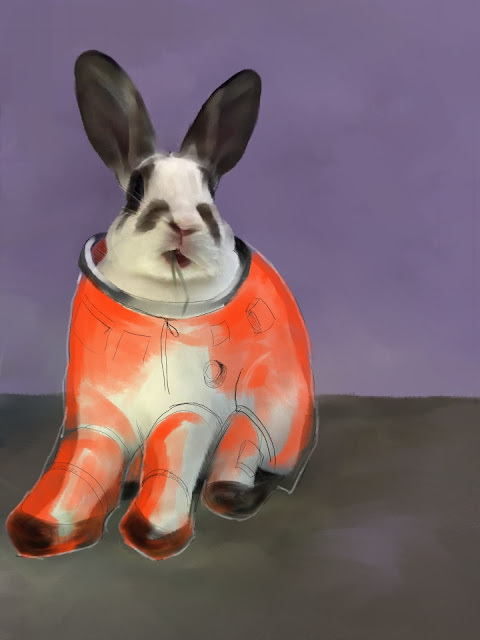 Disapproving Bun: God's Speed, John Glenn, from all the bunstronauts. One of the heroes, just like Grissom, White and Chaffee. Which is one of the reasons that the loony Moon-landing-deny-ers make me so angry. What, do you think those three men BURNED TO DEATH IN PURE OXYGEN FOR *FUN*? FOR THE GOVERNMENT? WHAT?! How DARE they suggest that all that happened for a movie?! The Moon landings were one of humanity's greatest achievements ever, and remain so, 47 years later. And Buzz Aldrin was 100% right to PUNCH someone in the face for daring to attempt to cast doubt on the Apollo landings' authenticity. We will not go back there in my lifetime. I am kind of glad that I was at least alive, though very young, before they ended in December 1972 (IIRC). I was too young to be aware of it, but at least I existed at that time. So Glenn was a brave pioneer, just like the others. Without him and his colleagues, we would not have successfully landed on the Moon, AND returned to Earth alive, multiple times, without any further accidents apart from the heroes Grissom, White and Chaffee. These men, and the others who braved the frontier of possibility with them, deserve our utmost respect. Ahh ... the Right Stuff! Thank you for the touching bun tribute.